Anybody who ventures onto social media and attempts to engage in rational economic debate about the case for Scottish Independence will quickly encounter "GERS deniers". The primary source of data for Scottish finances is the Government Expenditure & Revenue Scotland (GERS) report. GERS deniers are people who, when faced with the uncomfortable economic reality of Scotland's finances, choose to try and rubbish the data rather than address the issues highlighted by the figures. GERS deniers typically employ one of two generic arguments which are sometimes "supported" by a variety of specific misunderstandings, misdirections or myths. This blog post is an attempt to provide answers to the more common confusions - I'll try to keep it up-to-date and as always will correct if any factual errors are pointed out to me. 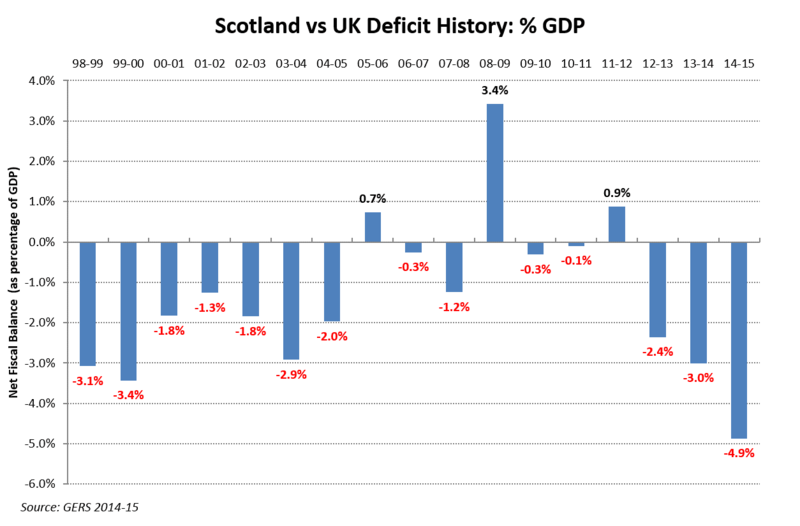 This blog has been very consistent about this: the GERS figures can be used to explain Scotland’s past economic performance (as an integral part of the UK) so as to inform our understanding of the future choices a possible independent Scotland would face. The GERS figures provide the foundations on top of which any credible economic case for independence must be built. To illustrate. According to 2014-15 GERS our pro-forma accounts show Scotland running a £14.9bn deficit. If - as the White Paper suggested - an independent Scotland were to spend £0.6bn less on defence and other costs (compared to the amount allocated to us in GERS) then our deficit would become £14.4bn. To suggest that how our fiscal balance would look based on the taxes we're used to raising and the public spending we're used to receiving tells us "nothing", "almost nothing" or only "relatively little" about an independent Scotland's potential finances is frankly insulting to the intelligence of the reader. The figures tell us a great deal about where we start from and the scale of the challenge we'd face. The GERS methodology has been developed and refined continuously since it was introduced. With each publication of GERS any improvements made are applied to past figures so the most recent publication always includes historical data restated on a consistent basis. In presentational terms, the report is now supported by very much more detail: this not only gives it increased credibility, but also makes it a very much more useful document"
As the GERS report itself explains: "The United Kingdom Statistics Authority has designated these statistics as National Statistics, in accordance with the Statistics and Registration Service Act 2007 and signifying compliance with the Code of Practice for Official Statistics"
This myth is summed up by a document written by pro-independence group Business for Scotland. This document has since been deleted but can still be found on the web and some of the assertions made within it are regularly repeated as fact on social media. "For many companies, VAT and Corporation tax for the whole of UK operations are paid at company headquarters which is most often in London or the South East of England. It doesn’t count as Scottish revenue, despite the fact it’s a tax paid on sales / profit generated in Scotland." The GERS Detailed Revenue Methodology states very clearly (page 13): “GERS apportions a share of UK corporation tax revenues based on the economic activity undertaken in Scotland and not the location of companies’ headquarters”. Similarly for VAT, the same GERS methodology document (page 19) makes it clear that VAT is allocated based on consumption survey data and has nothing to do with where companies report figures. This isn’t something that’s changed recently. The same statements exist on the same pages of the 2011-12 GERS Methodology Statement . "Put simply, if you buy a packet of Walkers shortbread in Tesco in Edinburgh, the VAT you pay is taken to be generated at Tesco’s head office in Hertfordshire." Apart from being fundamentally wrong about how VAT is allocated in GERS, they're also amusingly wrong about which products incur VAT. Shortbread is zero-rated for VAT purposes (unless it's chocolate coated). "There are other ways in which Scottish revenues are invisible in GERS. Much of the alcohol duty paid by the whisky industry is not counted as revenue from Scotland. Alcohol produced in the UK which is exported abroad becomes subject to UK alcohol duty at the point of export, and a large proportion of Scotland’s multibillion whisky exports gets shipped out from ports in England. The UK Treasury counts the duty levied on this whisky as income from the tax region in which the port is situated. Billions of pounds of Scottish revenue is magicked away in the official statistics, and doesn’t count as Scottish revenue. It masquerades as revenue from other parts of the UK, most commonly as revenue from London. 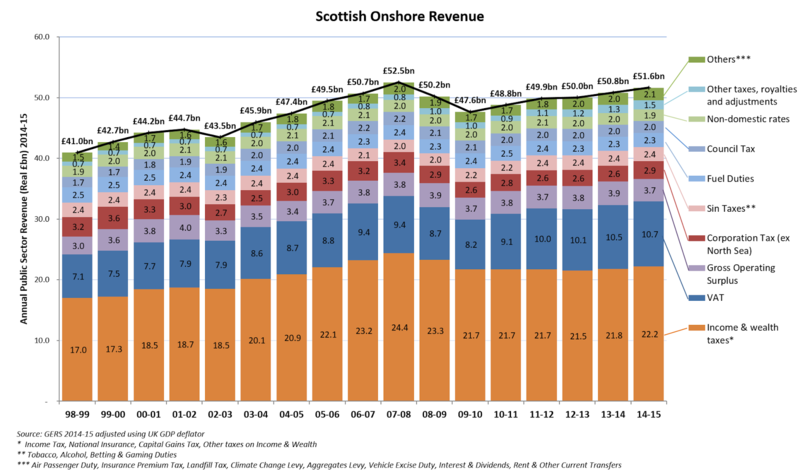 In total, the extra revenues which don’t currently figure in the GERS stats, but would accrue to an independent Scottish Treasury, would likely be larger than the entire annual income from the North Sea"
That article states: “The original version of this piece appeared on the splendid ‘Wee Ginger Dug’” and the first paragraph appears in precisely the same form in this Business for Scotland document. It also includes completely incorrect assertions about the effect of "head-office" reporting (see 1. above) on reported Scottish revenue figures. This is how myths are spread. Therefore, GERS estimates duty collected from Scotch Whisky based upon the level of whisky consumption in Scotland, even though Scotch Whisky is only produced in Scotland. Similarly, the estimate of tobacco duty collected in Scotland is based upon the level of consumption of tobacco products in Scotland, even though most tobacco goods are produced outside Scotland"
"No alcohol duty is levied on Scotch Whisky exported from the UK to the EU or third countries, whether from Scottish ports or from ports elsewhere in the UK. UK alcohol duty (excise duty) is only levied on Scotch Whisky when released from bond for consumption in the UK. Under EU law, the rate of excise duty has to be consistent across the territory of a member state. If Scotland were an independent country, the rate of excise duty on Scotch Whisky would be set by a Scottish Government within the parameters for excise duty on alcoholic drinks set by the European Union. The excise duty revenue accruing to a Scottish exchequer would only be the amount raised on the release from bond of Scotch Whisky for consumption in Scotland." "£2.8bn of whisky revenue counted as English export (because it goes out through English ports)"
“Public sector expenditure is estimated on the basis of spending incurred for the benefit of residents of Scotland. That is, a particular public sector expenditure is apportioned to a region if the benefit of the expenditure is thought to accrue to residents of that region. 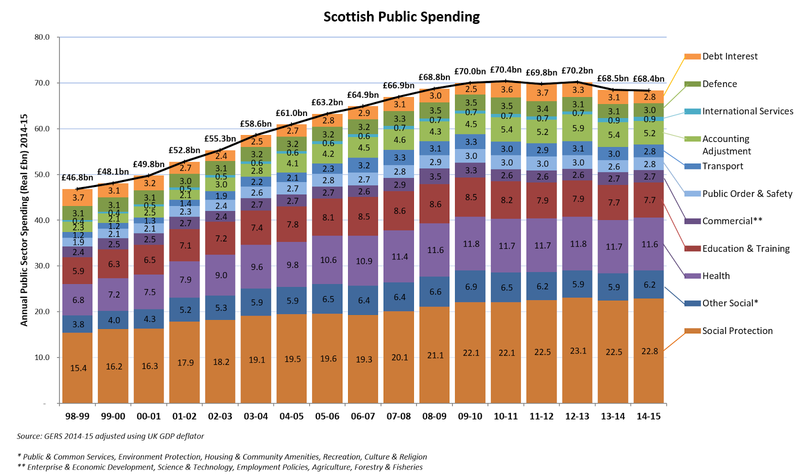 This is a different measure from total public expenditure in Scotland. 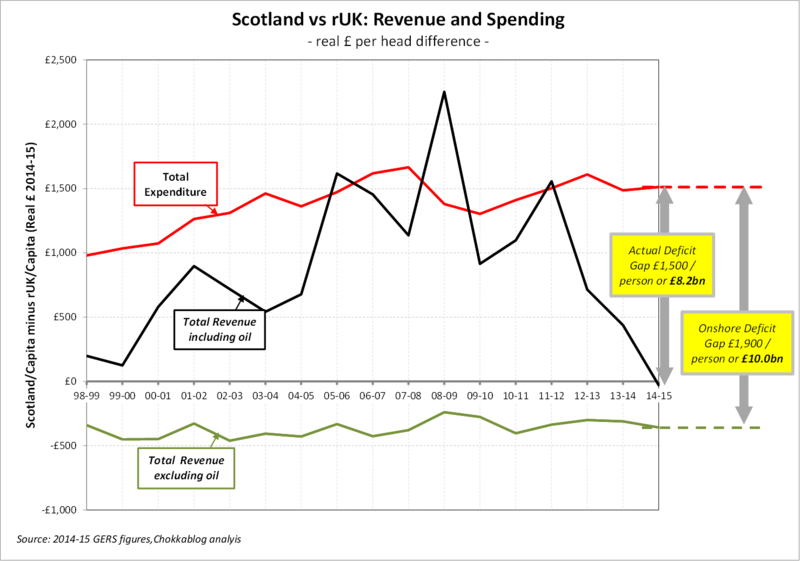 For most expenditure, spending for or in Scotland will be similar. For example, the vast majority of health expenditure by NHS Scotland occurs in Scotland and is for patients resident in Scotland. Therefore, the in and for approaches should yield virtually identical assessments of expenditure. However, for expenditure where the final impact is more widespread, such as defence, an assessment of 'who benefits' depends upon the nature of the benefit being assessed. 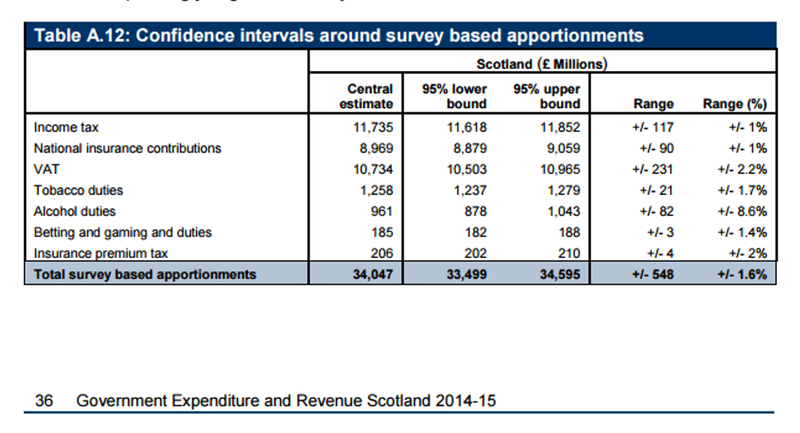 Where there are differences between the for and in approaches, GERS estimates Scottish expenditure using a set of apportionment methodologies, refined over a number of years following consultation with and feedback from users. 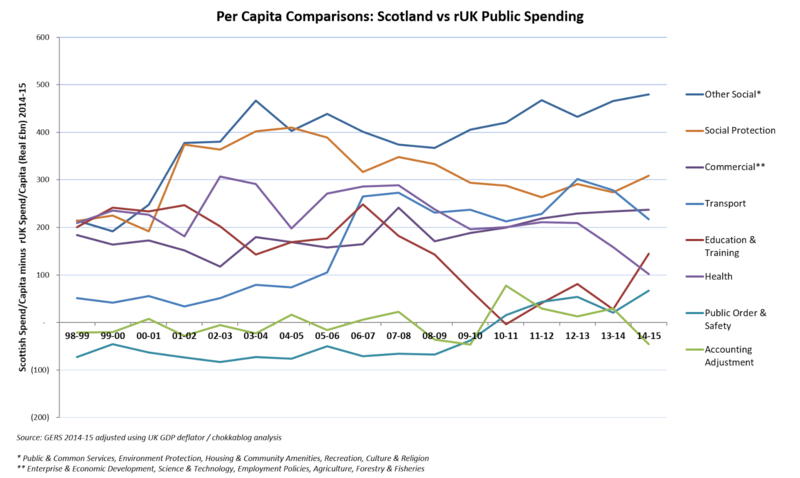 Needless to say, not all of the money spent "for but not in" Scotland would be replaced by money spent "for but in" Scotland were we independent: international services and debt interest being the main obvious examples. So this really boils down to a defence spending argument - how much would we spend and where would we spend it? The White Paper had a stab at this and ended up with a £0.5bn net saving. This comes up a lot from people who haven’t bothered to understand how the GERS figures work. At its simplest, the GERS methodology works to include only expenditure in Scotland or Scotland’s share of value from expenditure outside Scotland. This is clearly explained in the GERS detailed expenditure methodology paper. Another widely quoted example is HS2. Because Scotland’s share of the economic value of HS2 is assessed to be 2%, this is the figure used in GERS (page 77). Obviously London sewers costs and the like are not allocated to Scotland in GERS as they are clearly examples of "Identifiable expenditure" (that is expenditure that can be clearly allocated to a country or region in terms of having been spent for the benefit of that country or region). it's worth noting that the London sewers aren't a public spend at all, it's all private sector investment with Thames Water customers and some foreign investment paying for it. There's some government underwriting of risk (overruns etc) but no direct money. It really is a stonker of a myth. 5. The figures for the Scottish economy are understated because of exports assigned to "unknown region"
So the Scottish Export Statistics explicitly exclude Oil & Gas anyway and as the document states clearly: "The estimates in this publication are based on the completed survey returns from 1,664 businesses in Scotland to the 2014 Global Connections Survey". I've filled in these forms; the data is provided on the basis of where the customer is, not which port you ship from. 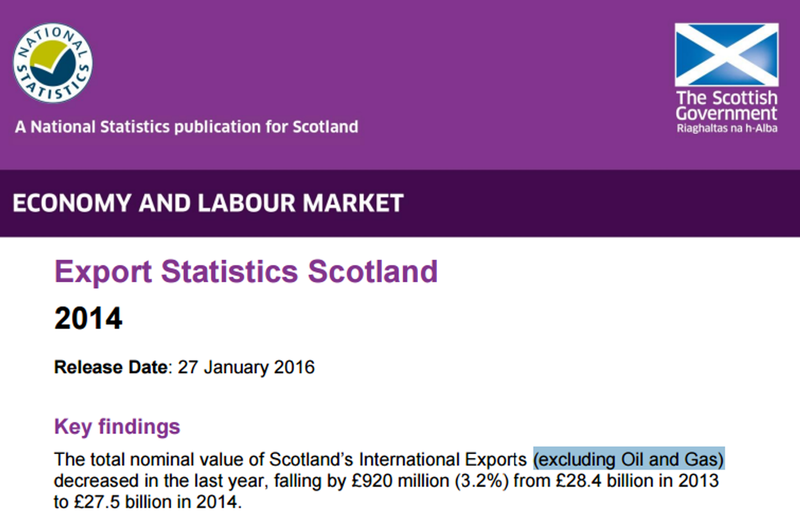 So this "unknown region" issue has no impact on the Scottish Government's published export statistics. Needless to say, HMRC regional export figures are not used when calculation our GDP (see Scottish Government "How is GDP calculated"). You can view the full list of data sources here and regional export data is not among them. Statements like this are often made by people who simply don't understand how statistics are compiled and who ignore that the data are accurate enough to be designated as National Statistics. The confusion arises because in some cases GERS apportions revenues based on survey data. The GERS report (page 36, Table A.12) includes confidence interval analysis that shows we can have 95% certainty that those figures are accurate to within +/- £0.5bn. There is one figure worth highlighting as being an heroic estimate and that is the assumption around (non-North Sea) corporation tax allocation. On this figure HMRC and GERS make very similar assumptions, basically assigning £2.9bn or 7.3% of corporation taxes to Scotland. As a sanity check, Scotland account for 8.3% of the UK's population. The simple truth is that given companies are not currently required to report profit split between Scotland and the rest of the UK, nobody knows what these figures would be were Scotland to be independent - changes to tax rates and corporates' decisions around where to base activities and how to report profits make this figure a moving feast anyway. Rather magnificently, the day after I posted the above blog I had this tweet drawn to my attention. 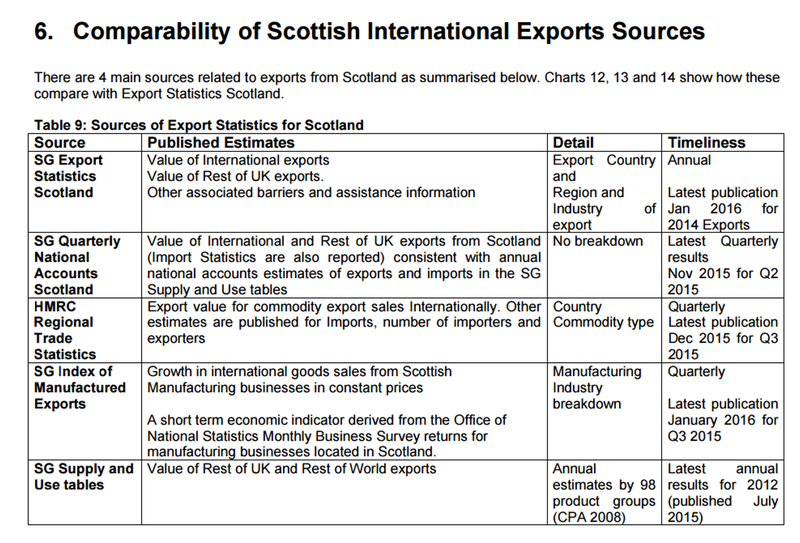 This combines confusion over export data (which is compiled by Scottish Government based on survey data, is completely unaffected by which port goods are shipped from & has no impact on our fiscal deficit figure), hints at lost whisky export duty (which doesn't exist), mentions the "unknown origin" HMRC data (which isn't used by Scottish Government and has no impact on our fiscal deficit figure) ... and somehow attempts to equate these with the "£15 billion black hole" (by which I assume he means the total fiscal deficit as opposed to the £10bn onshore deficit gap). So the examples he gives of "misappropriation of revenue" have precisely zero impact on our reported deficit or indeed any figures published by the Scottish Government - so they don't affect "my graphs" at all, thanks for asking. A very quick post to clear up the latest "the statisticians are hiding Scotland's true wealth" myth. 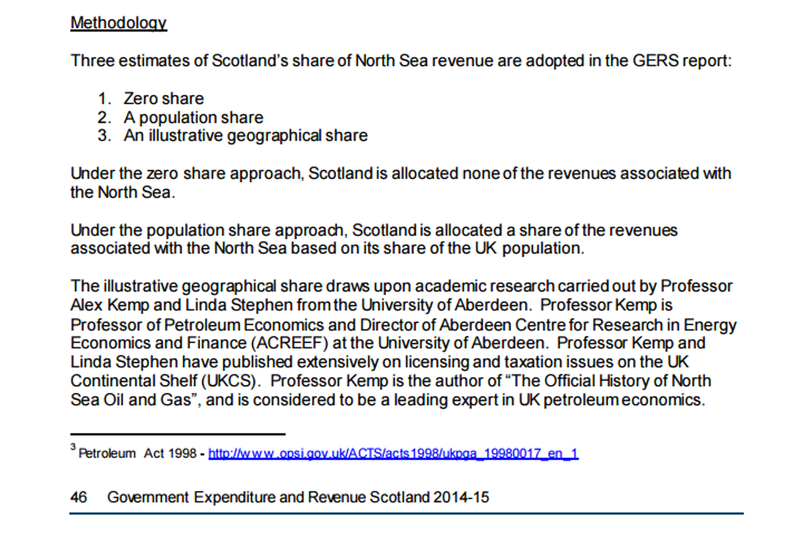 @jegteg @taylordauthor @Maclabhrainn This NorthSea 'Unknown Region' oil wealth is counted but not counted & listed as SCOTLAND wealth(GDP)? 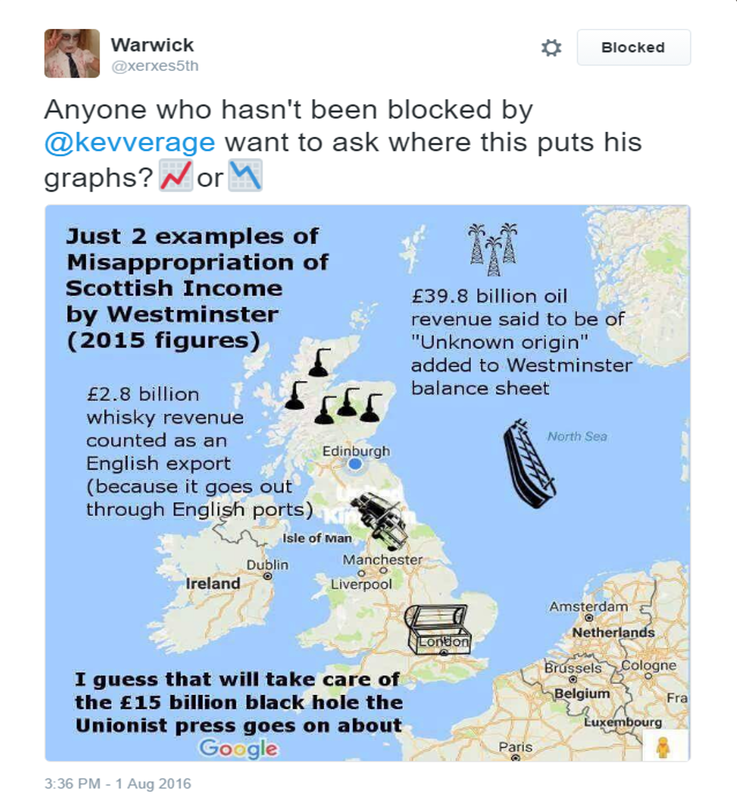 @RogueCoder250 @LabourOutOfScot "unknown" region... so, that will be Scotland oil & gas then. Nice one. There are loads more along similar lines (many from people who've blocked me funnily enough) which all suggest that the issue of "unknown region" in HMRC regional export stats must be hiding the true extent of Scottish GDP and/or by implication exaggerating our deficit. 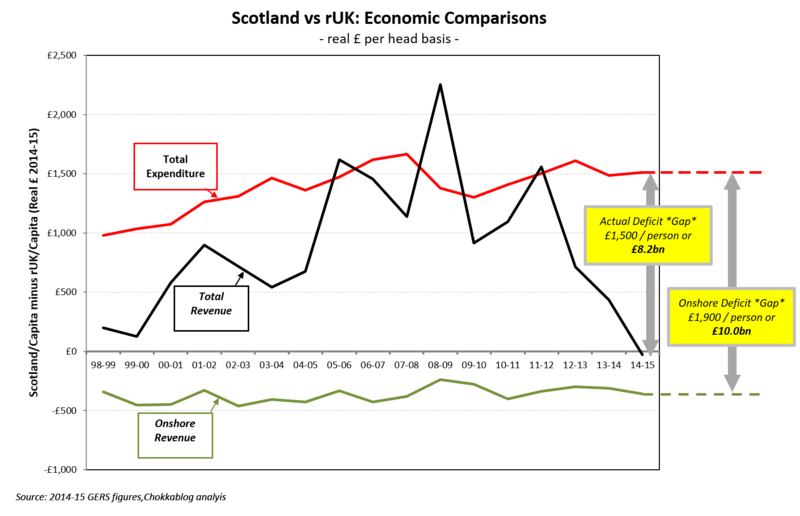 Frankly the idea that the Scottish Government might have missed such an obvious trick when calculating the value of Scotland's GDP is ridiculousness enough to let us know this is highly likely to be yet another calculated attempt at spreading misinformation - something independence supporters are very adept at. So the Scottish Export Statistics explicitly exclude Oil & gas anyway and as the document states clearly: "The estimates in this publication are based on the completed survey returns from 1,664 businesses in Scotland to the 2014 Global Connections Survey". But surely it means our GDP is understated? Well no, because the HMRC regional export figures are not used in our GDP calculation (see Scottish Government "How is GDP calculated"). You can view the full list of data sources here and regional export data is not among them. I could go on but this just gets silly. Some idiots on Twitter and Facebook have found a graph and leapt to a ridiculous conclusion in an effort to stoke a grievance. There are two types of people in this world: those who believe you can divide the world into two types of people and those who don't. Let me start again. There are two types of people in this world: those who contribute to the state and those who benefit from it. Which category any of us fall into is likely to change over the course of our lives. Those who contribute pay more in taxes than they receive in public spending; those who benefit don't. We pay taxes when we're employed and when we consume or transact. These include income and wealth taxes, VAT, fuel & "sin tax" duties, council tax and business taxes1. We typically generate the highest amount of tax during our adult working lives. Some of the public spending we benefit from is indirect in the form of public order & safety, transport, international services, defence and debt interest spending; but the majority we benefit from is direct in the form of social protection (including pensions), health and education spending2. This means we typically receive the highest amount of direct public spending outside of our adult working lives. So broadly speaking we start our lives as beneficiaries while we're educated, we become contributors as we work and consume most heavily and we return to being beneficiaries when we retire and have higher health and care needs. This matters because the ratio of contributors to beneficiaries is an important determinant of the health of our public finances. The main factor working against the public finances in this regard is our increasing life expectancy - something that proposed increases in the state pension age are of course designed to at least partially offset, by extending our tax-productive lives. Which brings us to one of the challenges that Scotland faces: despite the fact that compared to the rest of the UK we die younger, on average Scots are older. According to Scottish Government Statistics: "Scottish males and females have the lowest life expectancy at birth in the UK. Male life expectancy is 2.0 years lower than the UK average and female life expectancy is 1.7 years lower". This is consistent with ONS statistics. Alternatively if you download the data from the ONS mid-2015 dataset it's easy to calculate the %age of population aged 65 or over: for England this figure is 17.7% but for Scotland the figure is 18.3% . 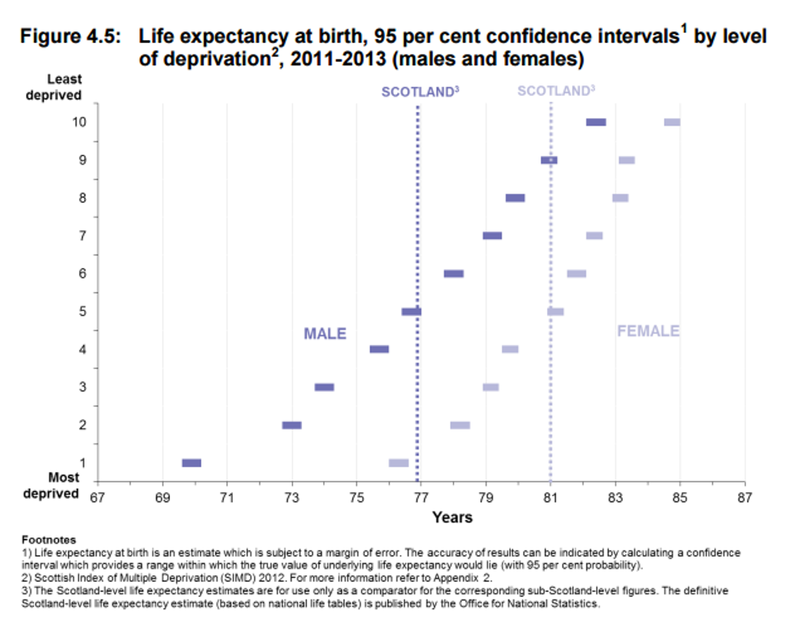 So Scots are on average older than the rest of the UK despite having lower life expectancy. 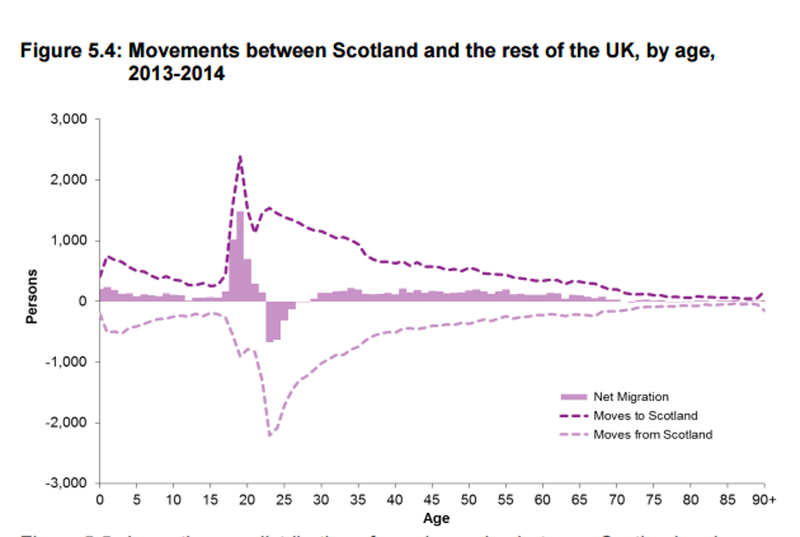 The explanation for this is of course the impact of migration: the rest of the UK has a higher net influx of younger people than Scotland. We'll come back to the implications of this but first let's consider the compounding issue of "Healthy Life Expectancy". 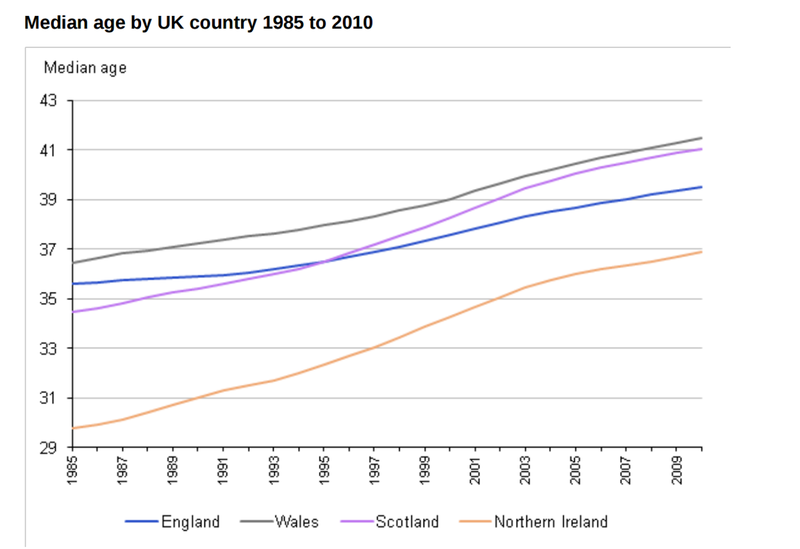 According to the ONS, Scottish males born in 2009-11 have a disability-free life expectancy (DFLE) of 60.6 years whereas those born in England can expect a DFLE of 64.5 years. So the proportion of Scotland's population that is (by this definition) at the age where higher health and care spending is needed is 23.0%/17.7% = 34% higher than that in England. 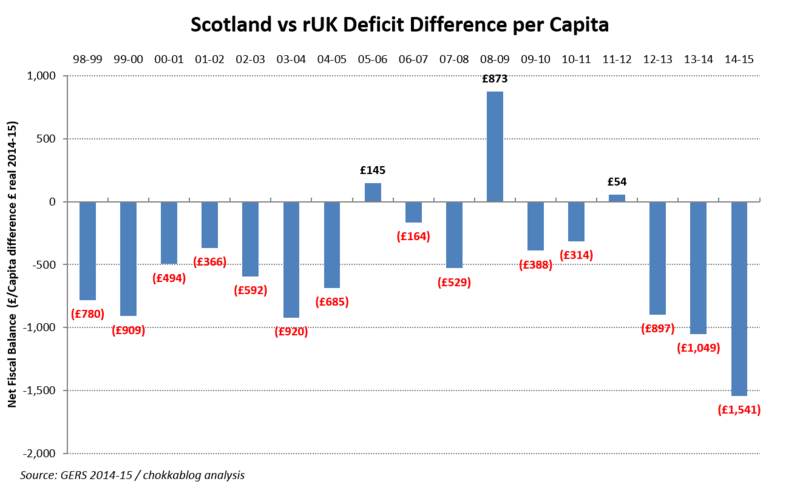 In the past this blog has often highlighted that Scotland is a "high cost-to-serve" country and that this is the main reason why (as oil revenues decline) there's an onshore deficit gap of about £10bn between Scotland and the rest of the UK4. One of the obvious explanations for this is our geographically dispersed population, but the "demographic challenges" explained above are less intuitively obvious and therefore perhaps less well understood. We can't expect politicians to do much about the geography of Scotland, but the demography of Scotland is something that can be influenced with political will. 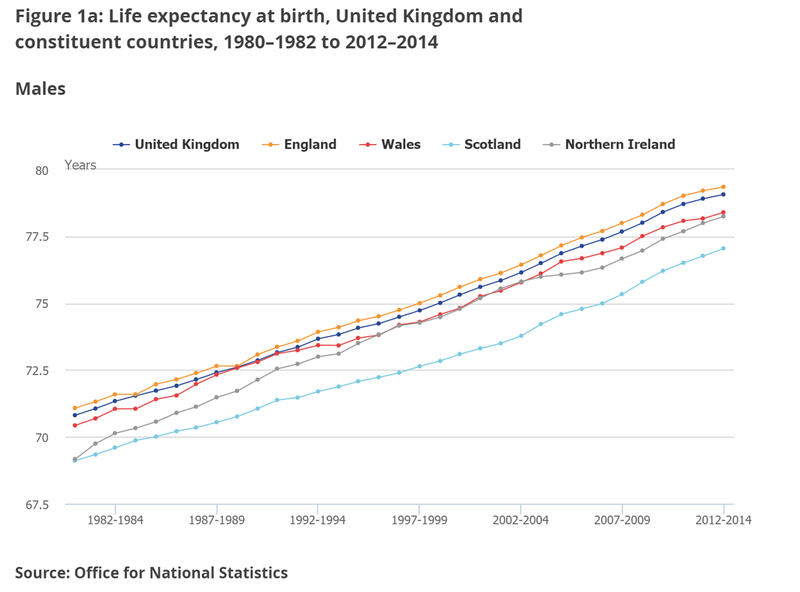 We can probably all agree that increasing life expectancy is a "good thing", not least because this should be a natural by-product of reducing levels of deprivation. But increasing life-expectancy of course increases the proportion of our population who are net beneficiaries of the state, exacerbating our fiscal balance problems unless we can increase the working (tax generating) population at an even faster rate. Which bring us to the vexed question of migration and the differences in perspective between Scotland and the rest of the UK. The net influx of migrants is focused around those of student and working ages5 who are on average contributors to the state6. 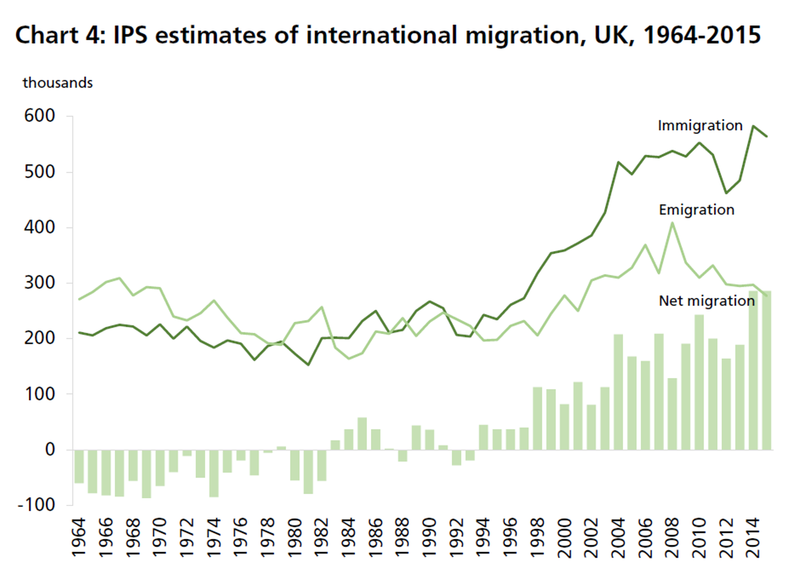 So in relative terms the rest of the UK has experienced 5.5/3.2 = 72% higher net overseas migration. At a macro level: the SNP know we need a continued influx of working age migrants to act as net contributors to the state and help alleviate the economic stresses caused by our relative higher proportion of older citizens who are (at this stage of their lives) net burdens on the state. This differential need for and perspective on migration is for me the strongest argument in favour of Scottish independence - but it's an argument that has to be balanced against a realistic assessment of the other economic implications. 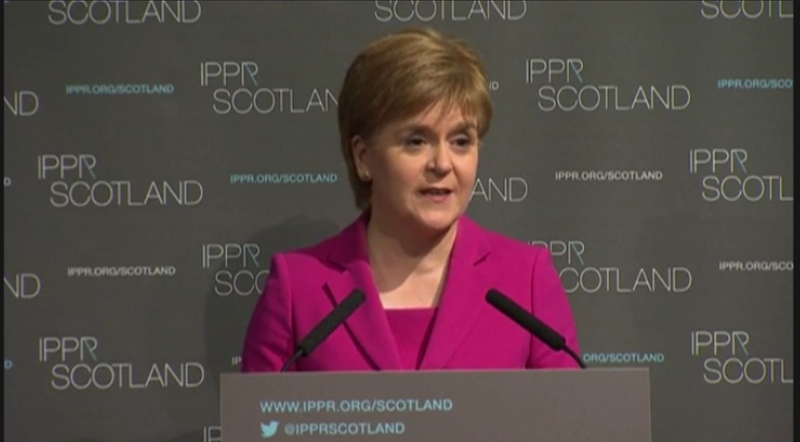 The SNP have been honest about Scotland's need for migration, but they have yet to present an honest economic case for independence that provides a realistic assessment of the pain that would be caused by launching our own currency (or joining the Euro), stopping the effective fiscal transfer from the rest of the UK and separating ourselves from our largest export market. It seems that there are two types of people in this world: those who believe in presenting an honest economic case, and those who don't. Looking at net migration between Scotland and the rest of the UK we see a net influx of those of student age (unlike other EU students, having to pay tuition fees) and then a net outflow on graduation before then returning to a modest net inflow.